I-Chi, pronounced "Itchy", is the best little chihuahua in the world!! He is just a big love bug. So his nick-name is I-Chi bug; and boy does he know it! When I-Chi gets excited he just smiles and wiggles all over! He enjoys being the center of attention and loves being a big goofball. His tail never stops wagging and he is a good watch dog but not yappy all the time. He has a beautiful and rare color. He is a Blue Fawn Sable Merle and is known to produce a rainbow of colors!! Is I-Chi available for stud?? 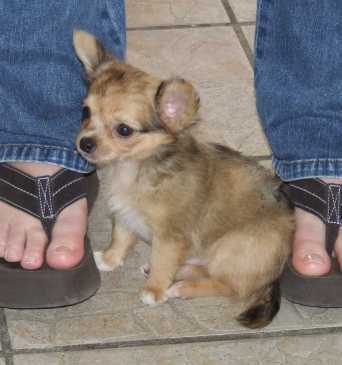 Our little boy I-Chi is available for stud to approved females only. He comes from excellent breedings and should produce a rainbow litter with a wide range of colors. He carries the chocolate, the blue, the merle, and of course sable genes. He is much smaller so he would be fine bred to a larger female. Female must be brucellosis tested NEGATIVE. Results must be available in writing from a licensed veterinarian. I gaurantee 2 live pups. Female must be registered with approved registries. Are there any puppies sired by I-Chi available?? Just watch the Nursery page. As soon as he has bred a female, there will be information on the expected litter. Once pups are on the ground watch the web site weekly for updated pictures and information on the litter.